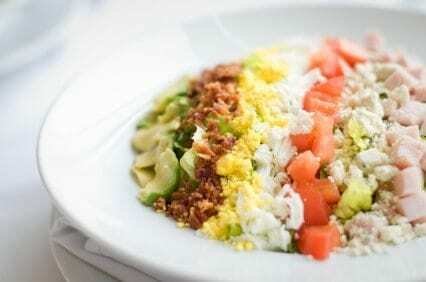 Have you ever had a delicious Cobb Salad? One of the first Cobb Salads developed was from the Brown Derby. What makes a Cobb Salad so tasty? Bacon, Avocado, fresh crisp lettuce, chicken, hard boiled eggs and more. This salad is so hearty it is a meal! You can make a Brown Derby Cobb Salad at home. Chop lettuce, watercress, endive, and Romaine in very fine pieces. Mix together in large wide bowl. Arrange chives, tomatoes, chicken, bacon, avocado, eggs, and cheese in rows over lettuce. At the table pour Special French Dressing over salad, toss and serve. This is what I read as to the creation of the Cobb Salad. The famous actress Norma Shearer was married to Irving Thalberg who happen to have a sensitive stomach. So, she asked the chef in the Brown Derby if he could create something that a baby could eat. Viola! The Cobb Salad was born. You can actually say the Cobb Salad WAS created by the Hollywood Brown Derby. Several years ago, my PR agency created the Dole Museum of Salad in NYC, and we highlighted the origins of classic salads like Cobb, Caesar, Waldorf. So… Howard Cobb, owner of the Brown Derby was closing up one evening when a group of high-profile customers came in. He went into the kitchen and either he or his chef (debates about credit) took whatever could be found, gave all the ingredients the same size chop to produce this beautiful salads.